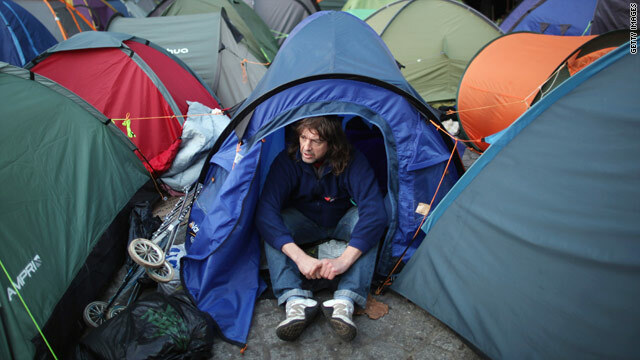 A protester camps out at St. Paul's Cathedral last month in London. Tony Perkins says Jesus had a different view of "occupy." Editor's note: Tony Perkins is president of the Family Research Council in Washington. (CNN) - One of the last instructions Jesus gave his disciples was "Occupy till I come." As Jesus was about to enter Jerusalem for the last time, just before his crucifixion, he was keenly aware that his disciples greatly desired and even anticipated that the kingdom of God was going to be established immediately on the earth. As a way to break the news that it wasn't going to happen in the manner and with the timing they expected, Jesus pulled them aside and gave them instructions by way of a parable. The primary purpose of the parable, which appears in the Gospel of Luke, was to make clear to his disciples that the kingdom of God would not be physically established on the earth for some time and that, until then, they were being entrusted with certain responsibilities. Jesus, depicted as a ruler in the story, would have to leave for a while as he traveled to a faraway place to receive authority to reign over the kingdom. In his absence, the disciples - depicted as servants - were to "occupy" until he returned. But just what does Jesus' order to occupy mean? Does it mean take over and trash public property, as the Occupy movement has? Does it mean engage in antisocial behavior while denouncing a political and economic system that grants one the right and luxury to choose to be unproductive? No, the Greek term behind the old English translation literally means "be occupied with business." As with all parables, Jesus uses a common activity such as fishing or farming to provide a word picture with a deeper spiritual meaning. From a spiritual perspective, the mina in this parable represents the opportunity of life; each of us is given the same opportunity to build our lives, and each of us shares the same responsibility to invest our lives for the purpose of bringing a return and leaving a legacy. Jesus gave equal responsibility and opportunity to each of his 10 servants. The fact that Jesus chose the free market system as the basis for this parable should not be overlooked. When the nobleman returns, after being established as king - a stand-in for Jesus - he calls all his servants together to see what they had accomplished in his absence. The first servant reports a nice profit: 10 minas. While the story lacks specifics on whether he invested the money in a herd of sheep or a hedge fund, we do know that he made his gain by engaging in business transactions of some sort. He used a free market system to bring a tenfold return on investment. No doubt such a return took a lot of diligent, dedicated effort. The newly established king praises the servant and gives him a reward that's an even greater return on his efforts, "because you have been faithful in very little I will give you authority over ten cities." Likewise the second servant in the story, who had turned his one mina into five, is praised and rewarded with greater responsibilities: He is given five cities. The third servant in the story had apparently either slept through his economics course or was just indifferent to the work delegated to him. He had essentially kept the capital entrusted to him under his mattress for safekeeping. When called to give an account of what he had accomplished, the man immediately attempts to shift the focus off his failure with excuses of how unfair the boss was because he was always trying to get more than he deserved for his money. The employee review is immediate and intense: "Out of your own mouth will I judge you, you wicked servant." The king's disappointment and frustration are nearly palpable. "Why didn't you at least put the money in the bank and draw interest?" the king inquires. While such language might prompt an HR complaint today, its meaning was quite clear to the disciples. There are no excuses for doing nothing. Parables generally have a twist near the end, a final jolt to drive the point home. This one is no exception. The ruler orders that the capital, or opportunity, given to the lazy servant be taken from him and given to the most productive servant. "To everyone who has, more shall be given," the Bible reads, "but from the one who does not have, even what he does have shall be taken away." Jesus rejected collectivism and the mentality that has occupied America for the last few decades: that everyone gets a trophy - equal outcomes for inequitable performance. There are winners and yes, there are losers. And wins and losses are determined by the diligence and determination of the individual. Some would argue that such an approach encourages abuses, the likes of which we have seen on Wall Street. While some egregious abuses have taken place, they are not inevitable or intrinsic to free enterprise. The parable of the king and the servants endorses the principles of business and the free market when properly employed. Remember, these servants were not working for themselves, but under the constraints of their lord and for his benefit. Likewise our free market system works when bridled by morality. Not arbitrary morality that changes with political parties, but transcendent moral principles. Yes, we are to "occupy," not by railing against a free market system that rewards diligence, even though it is occasionally abused. Rather we are to occupy by using that system ethically as a means to advance the interests of the one we serve. CNN should be ashamed of themselves for continually giving Tony Perkins a voice through their media when his Family Research Council has been labeled a "hate group" by the Southern Poverty Law Center. You would not even think of allowing the head of the Ku Klux Klan a voice, or the American Nazis, but you freely ask for Tony Perkins' position all the time. Shame on you for listening to this hateful man. He does not represent the opinion of a true free America. Liberty for all, inclluding those hated by Tony Perkins. Sorry buddy Perkins and followers of satan...jesus was made up by people like you! Too control people for your benefit. The proof is where he is portrayed as a white man with long hippy blond hair wearing hippy sandals and a white robe representing some kind of mental purity. Then there is the fact, that jesus was suppose to be a jew, and the jews don't even believe the so called jesus or messiah ... has even come yet! Then there is the bible description of jesus as a man with hair like lambs wool suggesting that he was a black man. Comon, the day of jesus freaks is over. It was just a cover up to keep us from knowing who we really are...The sons and daughters of God is us, as in little gods with the small g. We were created in the likeness of the image of God to which there can be No creditable disputes. Tony Perkins and most of those poli-religious spokespersons for the Christian Right promote a heretical doctrine based on greed and power. Christians should avoid supporting the candidates that champion these greed-is-good based doctrines, and that includes the entirety of the GOP ticket.